This entry was posted in All Classes, P5 on 05/04/2019 by centralps. Primary 3 and Primary 5 both had a great day visiting Culloden Battlefield. The trip really brought our learning in the class to life, and the children learned lots of interesting facts about the Jacobites and Bonnie Prince Charlie. Primary 5 learned about some of the people who lived at the time, while Primary3 worked on storytelling with our fantastic guides. Check back next week for some photos from our trip! This entry was posted in All Classes, P3, P5 on 29/03/2019 by centralps. Every year countless pieces of crisp packets end up in landfill sites across the UK. We are working with TerraCycle® to put an end to this enormous loss of resources. 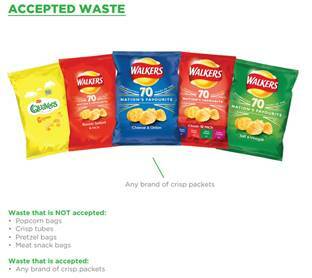 The Crisp Packet Recycling Scheme allows us to recycle your crisp packets and prevent them from ending up in landfill. Not only are you helping the environment, but the waste you recycle with us also helps to fund schools or organisations. We will be collecting crisp packets until 1st of April. The children attended a short assembly today to hear all about it and know where to put their packets. Some pupils from P6 will collect these at break and lunch time. This entry was posted in Nursery, P1, P1/2, P2, P3, P4a, P5, P6, P7 on 21/03/2019 by centralps. P2 and P3 will now attend the Northern Meeting Park on Friday 22nd March. P1 and P4 will attend on Friday 29th March. This is the run offs for the P1-4 pupils who will be selected to take part in the Baillie Cup on Saturday 1st June 2019. It would be very helpful if you could please ensure that your child has a pair of well-fitting trainers/running shoes for these sessions. This entry was posted in All Classes, P1, P1/2, P2, P3, P4a, P5, P6, P7 on 21/03/2019 by centralps. Parent Evenings will take place on Tuesday 19th March and Thursday 21st March. Appointment Letters were sent home today. Please check schoolbags and return the slip by Monday 11th March. This entry was posted in Nursery, P1, P1/2, P2, P3, P4a, P5, P6, P7 on 04/03/2019 by centralps. We have Scholastic Book Fair coming to school this week. All classes will have a chance to browse the Fair on Wednesday 6th March. The Book Fair will be open for parents to browse on Thursday 7th March from 2.30pm-3.30pm. This will be in the Community Room. Please find attached our most current Newsletter. This entry was posted in Nursery, P1, P1/2, P2, P3, P4a, P5, P6, P7 on 01/03/2019 by centralps.